It’s important that you’re able to recognise SEO success when you see it. Central to any successful SEO strategy is a successful content creation strategy, and writing great content is a time-consuming task. Therefore, a successful SEO takes time, and you don’t want to shut down an SEO campaign just as it’s starting to take hold. We’ve compiled a list of 4 ‘Must Do’s’ to help you to judge the success of an SEO campaign, and prevent you wasting your money on SEO. 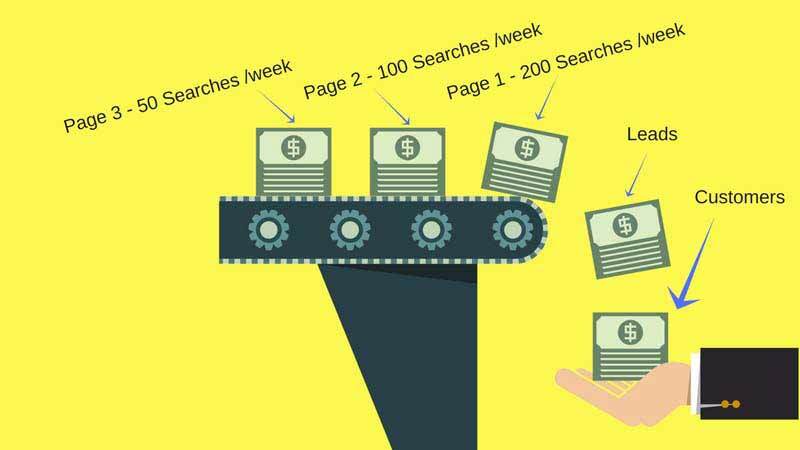 SEO often behaves in a binary fashion – when it comes to making money it’s either all on or all off. It’s therefore essential that you’re able to track the progress of your keywords as they slowly make their way from Page 3 to Page 2, Page 1 and then onto leads and customers. Being able to clearly see this progress will give you the fortitude and confidence to stick with the strategy before it kicks in and you start making good money from it. However, our new client has forgotten about Lifetime Value. In the example above, the service our client is supplying is periodic, and a typical customer will require the same service every 8 months. On average, their customers will stick with them for over 3 years. Therefore the true value of this lead is not $1,000 but $4,500 (36 months/ 8 months x $1,000). Wow! that’s a 600% Return On the $750 Investment. The client needs to be patient as they will not collect the full $4,500 for another 3 years. However, this is a classic example of how online marketing can help grow your company and how many people can be blind to the true value of an SEO campaign. You’ve used a lot of resources to get your SEO leads. You should, therefore, make the most of them. The best way to maximise the value of leads and customers is to use business automation to upsell and resell. A business automation system typically uses email marketing as well as social media advertising to offer new customers an alternate or additional product or service. Often, it will be necessary to re-think your existing products and services and redesign or repackage them to suit an automated online up-selling campaign. If you start with a small investment, your return on that investment will be small. It may sound obvious but look at the % and not the absolute values when judging the success. For example, if you are investing an annual amount $6,000, don’t lose interest if that turns into $18,000 and you ‘only’ make a $12,000 profit. I know $12,000 won’t change your world but that $12,000 represents a 300% return on investment. Also be aware that some of that $12,000 won’t make it through to your bank account until Year 2 and Year 3. Instead scale up – invest $30,000 and watch it turn into $90,000. That the beauty of most online marketing systems including SEO campaigns – they are scalable. A $60,000 profit is more like it!. Now let’s scale up again!